Whomp whomp. There're no Empress Bride Barbies for sale. 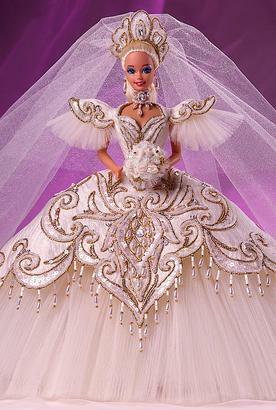 The Empress Bride Barbie is the fifth doll made in the Bob Mackie Series. She wears a glamorous, ivory brocade gown with an expansive layered tulle skirt. Her accents include a beaded chocker, stunning crown with marquis-cut rhinestone, a ring and a veil. Her dress is adorned with golden embroidery in a fleur-de-lis design. The Barbie was innitially supposed to be accompanied by an Emperor Groom Ken, however his prototype was not approved.